The Factory of theatrical rekvizit produces various types of embroidery emblems on their canvases. 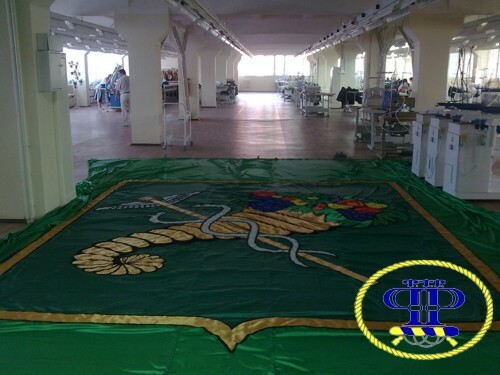 A special feature of our embroidery is that we can embroider large unlimited size area. We provide embroidery emblems, flags, logos. For law enforcement agencies and security organizations - chevrons, badges, shoulder plates, pennants, embroidered flags. Embroidery Emblem can be accomplished by several gold-colored metallic or viscose filament. As a rule, embroidery emblems performed on the satin or velvet. Embroidered Emblem developed by the standards of heraldry become a family heirloom. Embroidered Emblem will be very bright and voluminous. 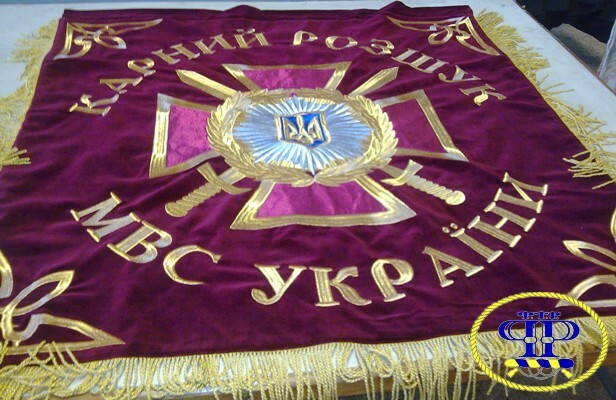 Over the years, embroidered coat of arms does not lose the colors. 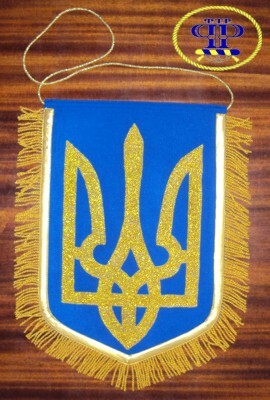 Embroidered Emblem of Ukraine on the natural velvet using the latest advances in technology embroidery will decorate any room in the office, and can also serve as an excellent gift to colleagues or superiors. 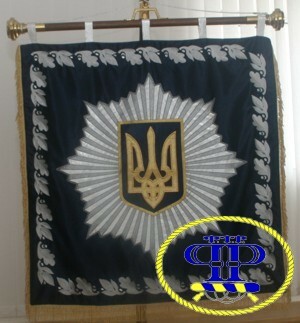 We provide embroidery on all types of flags: desktop and advertising flag, flags for the premises, street flags. Embroidery flags - the most durable way of a logo, emblem or any other images on the fabric. 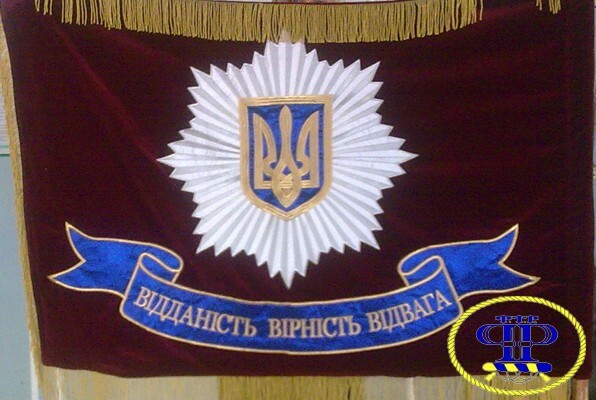 Embroidery on the flag during the operation will not lose brightness and color. Embroidery of flags is made of high quality threads on all kinds of fabric: silk, polyester (100% polyester), satin, satin, velvet, etc. F.T.R. provides embroidery flags on modern German equipment in the shortest possible time. 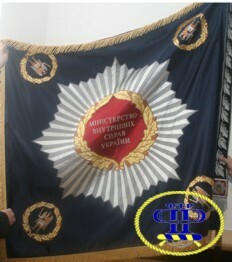 For embroidery flags you need only provide a mock-up of the flag in electronic form. Our factory accepts individual orders for embroidery on any finished products - clothes, blankets, curtains. Custom Embroidery your picture will give the brightness, reflect your personality. Embroidery custom made for modern equipment to embroider custom designs, logos of any complexity on any type of tissue. Terry-cloth goods, woolen rugs, drapes and curtains, leather handbag will look different after applying decorative embroidery on the order. Theme, name, or a humorous embroidery on the order tablecloths, napkins, bags, t-shirts give exclusivity of any thing. You can choose custom embroidery from our extensive database or submit your sketch. Embroidery on order can contain more than 10000 thousand stitches and be colorful and bright. You can order the embroidery not only finished products but also on the details of a cut, which is very convenient. Embroidery on order can be any kind netey, including gold and silver. At our factory are working professionals. High quality software for embroidery machines provide excellent quality products.